During the weekend, the undisputed protagonists are the judges, coming from each corner of the Catalan and Spanish geography, and with the presence of foreigners from countries such as the Netherlands, Italy or Portugal. For the occasion, the number of qualified beer judges has risen to 52, an increase of 50% over the previous year, necessary after the aforementioned increase in participation. These are passionate beer enthusiasts and professional who, under the direction of renowned local beer judge Albert Barrachina, assign the scores to the different competing beers, following the BJCP 2015 style standards. It's a hard life, but somebody has to do the job. Internal operation requires good, precise logistics. All beers have been refrigerated until their evaluation, when they are transferred from the refrigeration chamber to the evaluation room in boxes. Then, behind a screen, beers are poured into glasses and presented to each of the judges with a coaster and an ID code. At this point, the judges fill a scoresheet for each of the beers, marking and describing them to the maximum detail, avoiding simplifications, according to the Director's indications. 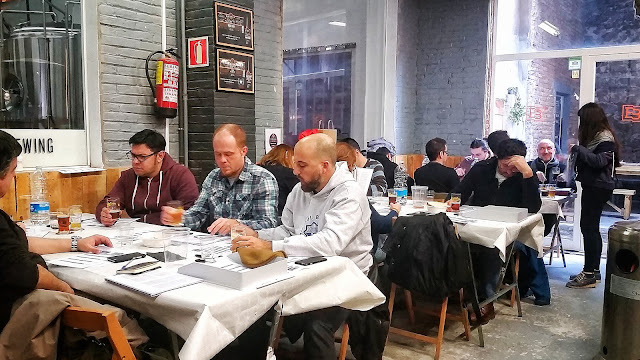 Eloy del Río, a Sevillian, former brewer at SON and Birra Amiata, and now brewer at Río Azul Brewing, was satisfied with his first participation as beer judge at the Barcelona Beer Challenge, contributing his two cents to the growth of local beer culture. Like other judges who have travelled specifically for the occasion, he has taken advantage of these three intense days of evaluation to visit places and colleagues from this Southern Europe beer capital that Barcelona is nowadays. Marc Roig, judge and collaborator for beer blog El Jardín del Lúpulo, claimed fatigue yesterday during the lunch break after tasting more than 50 different during the three days of evalutions. Given the high proportion of hop-forward beers, he was really looking forward to a good Milk Stout after the show, for 1 out of 4 beers in the contest -25.2%- fell into the American Pale Ale or India Pale Ale categories. Once again, during the awards ceremony of the BBC 2017, we can expect that these will be two of the categories that will arise more excitement among the attendees. The result of the Barcelona Beer Challenge 2017 will be premiered at the aforementioned awards ceremony, which will be held on Saturday 25th March at 6 pm, within the framework of the activities programme of the Barcelona Beer Festival 2017. The ceremony aroused great interest among the public last year, and this time we are preparing a new, dynamic format for the event, taking advantage of a better equipped venue and the increase of capacity for the auditorium. At the end of the ceremony, from 21:00, those awarded as 'best brewery' and 'best new brewery' of the contest will have a special Meet the Brewer session to celebrate their triumph with the Festival attendees. We'll see you there! Transparency disclaimer: I am a member of the Steering Committee of the Barcelona Beer Challenge.